Here are some notes that I made (to anticipate likely questions) to prepare for a radio interview on the EMdrive and how MiHsC explains it, that was recorded yesterday (on 'Hotel Mars' with John Batchelor and David Livingston). The audio interview is available here (this version has better audio) and The Space Show here. The emdrive is a truncated-cone made out of a copper shell with microwaves resonating within it. A bit like a microwave oven built into a metal megaphone. Roger Shawyer from Britain & Guido Fetta from Italy discovered that such a thing moves slightly towards its narrow end. The thrust is tiny: ~1mN per kW so the acceleration is on the order of 0-60 mph in 3 days, so it won't be on The Grand Tour anytime soon, but the crucial thing is that it accelerates without expelling propellant, an ability that gets rid of the need to carry heavy fuel and therefore revolutionises the prospects for interplanetary/interstellar flight. It is the equivalent of moving your car by sitting in it and pushing on the dashboard. Physics disallows this because if you push forward on the dashboard, your backside pushes back on the seat and the two forces cancel. This is due to the conservation of momentum, which has never been seen to be broken before. Physics says you can’t move unless you leave something behind. If you throw your shoe out of the back of the car then the car (if the brake is off) will move forward, because you expelled something. That is how rockets work. The emdrive does not expel anything so physics says it shouldn’t move. It violates a central part of physics (the conservation of momentum) which has never failed before, so if it is confirmed physics will need a radical change (see below). Also, the applications are huge: hovercars, launching without rockets, new energy sources from apparently ‘nothing’, and interplanetary and interstellar travel becomes practical because this engine works without having to carry heavy fuel. How many groups have tested it? UK. Shawyer, 1999-. Many experiments have been done. Several reports have been published on the SPR website. China. Juan et al., 2012. They got a larger thrust than Shawyer, but later found an error, and their recent results are null, but consistent with the other results since their apparatus is unable to measure the likely thrust. US. Guido Fetta, 2014. The Cannae drive has a much flatter shape, but they also found positive thrust. Germany. Tajmar et al., 2015. They also saw a thrust, but the emdrive also thrusted when upright, which needs to be looked into. US. NASA, 2014. Tested positive for thrust, but in air. US. NASA, 2016. Tested positive in vacuum and published a peer reviewed paper. What is different about the new NASA paper? 1. NASA tested the emdrive in a vacuum. One of the earlier criticisms was that the thrust was being caused by air currents. This is obviously now ruled out since they saw the same thrust in a vacuum. 2. It is a peer reviewed, checked by other scientists. Most of the experimental papers on it before this have been conference reports, not subject to the same rigour. It was apparently a very long and difficult process too, so Dr Harold G. White of NASA should be commended for having the courage to do this in the first place, and for his hard work through peer review. 3. It is NASA, so it has raised the profile of the emdrive. The NASA emdrive results (see the recent paper) are interesting because they get weaker thrusts than everyone else so far, and also they tend to put dielectrics in the narrow end of their cavity. Quantised inertia predicts that the dielectric should thrust the other way, cancelling the force due to the taper of the cavity. I need to look into this in more detail. I can use an analogy with ships at sea. Usually waves hit ships from all around so they don’t push them on average, but if you put two ships together there’s a sheltered zone between them, so suddenly more waves hit the ships from outside then from between them, so they move together. If the crew don’t know about the waves they’ll think it odd, like physicists think the emdrive is odd. Quantum mechanics predicts there’s a quantum sea all around us called the quantum vacuum and the Casimir effect and Lamb shift have proven its existence. Relativity predicts that when objects accelerate, information horizons appear in the opposite direction to the acceleration vector, since information cannot catch up to the object from behind that horizon, and relativity has been tested. I’ve suggested that relativistic horizons damp the quantum vacuum, just as the ships damp the sea waves, making a void that pulls the objects back against their acceleration. This model, called quantised inertia or MiHsC, predicts the old property of inertia (which suppresses accelerations). It also predicts galaxy rotation exactly without dark matter or any adjustment and cosmic acceleration. 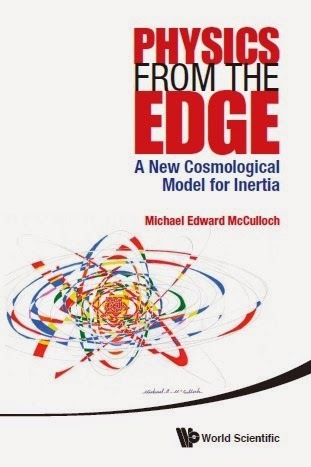 I have published 12 papers on this and a book called ‘Physics from the Edge’. Quantised inertia can model the emdrive too because it allows more quantum waves to exist at the wide end of the cavity so microwave photons that go to that end gain inertial mass, they’re heavier. This is like a rocket expelling mass at the wide end. Another way to think about it is that the microwaves’ centre of mass is continually being shifted towards the wide end, so the emdrive cavity itself moves towards its narrow end to conserve momentum. An analogy is a person on a ship who keeps walking from the front to the back. Every time he goes to the back he picks up a weight from the deck. This moves the centre of mass of the ship backwards, so the ship has to move forwards slightly to conserve momentum. What is MiHsC/QI in a nutshell? A summary: quantised inertia says that relativistic horizons damp the quantum vacuum, making it non-uniform, creating new forces. A poem: Go to the right, the left’s out of your sight. A horizon appears, damps zero point fields, dragging you back. Inertia is that! What has been the response of the scientific community to MiHsC? They have mostly ignored it, so far. Two criticisms they have made are that the Unruh radiation (quantum vacuum) I’m using has not been seen, but it is a widely-accepted prediction akin to Hawking radiation and may have been seen in experiments recently. The second criticism is that I’m varying the speed of light in the vacuum, but this is not so serious since special relativity only demands that light is emitted at a constant speed, c. Apparent speed of light changes happen in general relativity all the time but are explained away with bent space. Also, NASA tests may have shown light changing speed (space bending) in the cavity. Interest is growing and a few people are now working with me: including Dr Jaume Gine who recently worked with me on this paper, and Prof Perez-Diaz who is a very capable experimenter. He recently visited me and we designed some experiments, including the LEMdrive, that he is now doing. What other theories are there? Many people have said there must be an experimental error, but no one has suggested an error that fits the data. For example, the heating/expansion of the cavity can offset the centre of mass and make the cavity move to conserve momentum, but that and other errors were calculated in the NASA paper and found to be too small. Roger Shawyer has a theory that uses special relativity to explain it, and while I respect him for the experimental emdrive discovery, I don’t accept his theory because relativity should also obey the conservation of momentum. The emdrive does not. Grahn, Annila and Kohlemainen from Finland have an interesting idea that photons in the emdrive are pairing up and cancelling each other out, so they can leave the emdrive undetectably through the wide end, pushing it towards the narrow end. However, this theory relies on many assumptions and ‘invisible stuff’ and I haven’t seen a comparison with data yet. In their new paper, NASA propose that the particles in the quantum vacuum are ‘real’ (a non-standard view due to David Bohm) so that sound waves can exist in the quantum vacuum and it can act as a momentum sink. An interesting approach, but again it is adjustable and complex so it’s easy to get the right answer for the wrong reason. Also, I’ve not seen a comparison with the emdrive thrusts. What’s Next for the Emdrive? It has been given a boost by the positive NASA test, and I admire the NASA Eagleworks people, eg: Dr Harold G. White, Paul March and others, for having the curiosity and courage to test it. The next step is that universities need to get involved and perform rigorous tests, and do some crucial experiments, that those who have theories can suggest. There should also be a test in space. The Earth is a messy environment, and you never know what electromagnetic forces might be around. In space, it’s cleaner. Guido Fetta aims to test an emdrive in space using a 6U cubesat (small satellite), possibly in 2017. It’ll have a solar panel to power it and be pointed narrow end up, so if it stays in orbit longer than expected that’ll be a sign that it is thrusting upwards. If it works, it’ll change the satellite industry completely. Also, the quality factor of the cavity is a crucial parameter. This is the number of times microwaves can bounce around inside without being absorbed. So Guido Fetta and Roger Shawyer are now trying out emdrives coated inside with a superconducting layer, because they have much better Q factors: far more photon bounces. Cannae has also proposed a deep space probe, that uses 10 em-/Cannae-drives powered by RTGs to accelerate at 8.66x10^-3 m/s^2 from low Earth orbit to Sol escape velocity in 2 months. It could travel 0.1 light years in 15 years (1.35% c). This could be the first interstellar probe. To do this with a rocket you would need to carry a Ceres-sized amount of fuel. Isn’t there a suggestion that dark matter can predict the emdrive? Someone wrote a blog saying it could be dark matter. But, dark matter is an awful hypothesis. It has been forgotten that in 1980 or so physics failed to predict the newly-observed galaxy rotation: they rotate so fast they should explode, but don’t. Instead of changing the theory, they added ten times as much dark mass to galaxies as there is visible mass, to hold them in by gravitational force, but they have to add it by hand to each galaxy differently. Some galaxies are 92% dark, some are 99.3% but there’s no reason behind these numbers, and dark matter is not falsifiable: if your multimillion pound experiment can’t find it, you can say “OK, maybe it’s in this other more difficult regime” and that can go on for ever. In the same way you can glibly say "dark matter drives the emdrive" but until you point out a specific process that can be tested or falsified it is meaningless hand waving. In contrast quantised inertia predicts all galaxies (and the emdrive) without any adjustment, and Unruh radiation is something that can be looked for in one place and is either there or not. It is falsifiable. Is the emdrive a warp drive? Well, it’s not based on Alcubierre’s warp theory, but I’m suggesting that the speed of light changes within it. This can happen in relativity if you bend spacetime to make sure the change in c is not measurable to an observer, say a bug inside the cavity, so maybe space-time is bending in there. NASA found something like that when they fired a laser through, but couldn’t quantify. Do you think the emdrive is really anomalous? Yes. Of course there is always doubt in science, but as Captain Kirk says in the film Star Trek: Generations "You have to take some risk if you want to sit in that chair", and the emdrive has now been successfully repeated in 4 independent labs. So you have to pay attention to that. It's vital in science to value new observations over old theories. It’s a time to be excited: anomalous observations such as galactic rotation, cosmic acceleration, the flyby anomaly, the emdrive and many others are forcing a rethink of physics. In my opinion they are all telling us that mass-energy can be created from information horizons, this is the basis of quantised inertia, and the theoretical and practical implications are huge. I’m hoping now that universities will get involved in tests. do not believe in dark matter, too. curve, etc without dark matter. but you may shed some light if I am mistaken somewhere. May I write an email about my idea to you? Tamas: OK, feel free to email. First, let me say that I'm enjoying your book a great deal and that your concept of quantised inertia is highly intriguing and persuasive. I think you've injected a new and fresh approach into what seems a rather stale astronomical field. In regards to dark matter and its supposed distribution around galaxies in order to explain anomalous rotation curves, I was wondering what your thoughts are on the issue of gravitational lensing. Could the observed magnitudes and shapes of lensing be a result of ordinary matter's gravitational bending of light (that is, do you consider that the same effect could result without the gravitational contribution of dark matter)? I understand that modellers invoke dark matter on an ad hoc basis to fit the individual rotation curve observations, and I wonder whether any discrepancies exist between these and how light is lensed in these systems? Anyway, thanks for your stimulating book! "Is the emdrive a warp drive? No, it’s not based on Alcubierre’s warp theory"
- James Woodward's Mach effect, which is primary an impulse drive and not a warp drive, but the second term of his transient mass equation shows the mass could fluctuate so largely it could become negative, i.e. exotic matter (this part is still very speculative). Astro_01: I'm glad you're enjoying my book. Yes, the lensing of light is explained by MiHsC/QI in the same way as matter, though I have not published a paper on it yet. Julien: Good point. My 'no' was probably misleading so I've changed it. As I said, I expect one of the consequences of MiHsC/QI in the frustrum would be a change in the space-time metric to ensure that the changes in light speed predicted by MiHsC are not measurable for, say, a bug trapped in the cavity. So, there are aspects of warping to it. Have you had time to read my email? What do you think about it? Is it bad? Dear Tammor: I will reply to you by email soon. Alcubierre warp drive? Any method able to manipulate inertia and mass should be able to create Alcubierre metric effects. MiHsC/ Horizon mechanics falls into that field. Two of the better developed Alcubierre variants appear to be James Woodward's traversable wormholes and Harold White's own modified-Alcubierre warp drive metric noted by Julien above, though brane cosmology and Woodward's mass fluctuations need not apply to achieve the same outcomes. to do with conservation of momentum in the way that you suggest that the principle is violated by your theory; and, second, the most distance that the 'shape/length' of the boat could be changed longitudinally is the length of the boat (from all the mass initially being located at the prow and finally being located at the stern!). Such action will not generate a 'forece' to accelerate the boat - and, thus, the centre of mass location does not change at any stage! You may wish to rethink it as an analogy, since it is clearly inaccurate, and causes one to think that your actual theory may be 'smoke and mirrors' (which I don't cutrrently think is the case - but I'm still analyzing your ideas and the related mathematics). Hi Mike, I was reading your blog posts on emDrive and Unruh effect in it. I noticed that you use terms such as dark matter and ZPE. At some point you stated that dark matter concept will be dead along with Michelson-Morley experiments. I found it strange that you use terms dark matter and ether almost interchangeably. Is it now a time to pause and first agree on the terms used? Maybe this book is a good start? "Ontological Aspects of Quantum Field Theory"